Maybe you believe that there's strength in numbers. Maybe you have that competitive edge that thrives off working out around others to push you that little bit further. 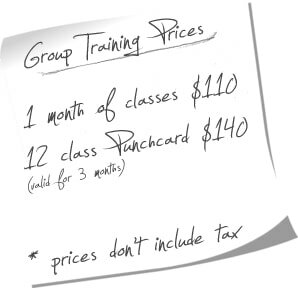 Maybe you want the attention of a qualified personal trainer at a fraction of the cost of personal training. ​We offer a number of group-based training programs that will satisfy these needs. ​Like a mythological hybrid, this class is half physical conditioning - exploring our body's natural potential for movement - running, jumping, lifting, carrying, pushing, pulling, twisting and turning; and half yoga focusing on breath and body alignment to help support both the strength and flexibility of the body. It's Friday! Do you really expect me to still be serious at the end of the week? By the time Friday rolls around I'm giddy and playful... and so is this workout. Trying to get us back in touch with our inner child. Let's tap into our inner Energizer Bunny™. A total body cardio workout without a lot of rest... we just keep going and going. Isn't the name pretty straight forward? We're gonna lift some weights. Pick 'em up and put 'em back down... a couple times. Are you glued to a chair for most of your day? Are you at the age where things just aren't moving as well as you (or your doc) think they should? Are you feeling tight and know that it shouldn't be THIS bad? This one's for you! Breaking the monotony of the day with 30-minutes of mobilization and re-alignment. (Total Body Conditioning) – after a thorough warm-up, we’ll target the entire body with these “quick-and-dirty” workouts. Call it “core”, call it “Abs & A**”, call it whatever you want – you get the point! We're gonna focus on their development for the entire workout. ​Foam rollers, lacrosse balls, mobility exercises and stretching will leave you feeling like a million bucks. This 30-minute class looks at un-func’ing dysfunctional movement patterns and restrictions in mobility. This has become our “Signature” class where anything and everything is possible. Expect the unexpected. The challenge is against yourself! Sounds festive doesn't it? Well then 'tis the season! Consider a workout using weighted medicine balls, stability balls and kettlebells as the only “tools” for the workout my gift to you. This includes pre- and post-program Abilities Assessments; over 15 hours of physical conditioning and instruction by a certified trainer; 2 hours of informative lectures and seminars.